Even if you may not ordinarily have use for any under-pass or over-bridge that has sprouted over or embedded the city, would you rather try both for the heck of it? You will be so much the knowledgeable for it about public spending abuse. You will get an angle to corruption, an abomination in public interest betrayal that ironically happens to be the least publicised. That small is the opposite of petite, can be indeed so ugly, mean and deceitful you have only to experience to believe. You will feel in your bones what the multitudes of foot-soldiers and subalterns have to suffer along the tunnels and through the 'hanging' over-bridges. Leave aside the splotches of dirt, filth, obnoxious graffiti, begging, hawking, denial of right of way and making passes at girls and women, the focus is on a peek you get at the shady side of Dhaka City Corporation (DCC) public works engineering department and its contractors involved in putting up the structures in the first place. The number of steps within the underpasses are fewer than required making for a steep climb and descent. And, the over-bridges have such narrow and small stairs on all sides that it is extremely unsafe to walk up and down the steps. The users sample a bitter pill of pedestrian life, but no citizens' group, let alone a political party, otherwise crying hoarse over so-called 'weighty' concerns would make an issue of it. For, it is perhaps beneath their dignity to waste their breath on. Usually, it is the people of the wards of the DCC that should have resisted such defective public works before they came up. This sort of potential civic voice should now get aired through the window of the Right to Information Act. Post-auditing, assuming that this is done, cannot be of any help in enforcing standardisation of public interest projects. Then look at the bus stopover sheds that are not only few and far between, they are also as fragile as these are slender; much too inadequate for the rush of passengers. They face terrible hardship through drizzles, heavy downpour and storms. The long queues may be a sign of discipline, but it must be cheeky amusement for those who have skimmed money off reneging on agreed (or manipulated!) specifications. 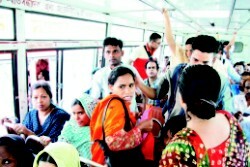 Imagine the insides of the buses -- hardly any leg room between the rows of seats and along the passage, and with the roof under-height, the passengers inside go through a living hell, female passengers being the most harassed of the lot. The dispensers seem to be in love with small things which are a beauty as money spinners but an existential torment of the daily grind for many. Dhaka being an over-populous city the smallness of public service vehicles and counters goes to highlight the suffocation of civic density. Contrast this average lifestyle with several oversized vehicles per family at the up end of the wealthy and government hierarchies taking up disproportionately more space of the road than would be allowed in any other metropolis around the world. Car-users, regardless of their social and economic standing, have to leave their modes of transport in allotted parking spaces through a zoning method thus freeing up the rapid busy areas of the metropolis. Essentially, it is the rapid mass transit system that must be rolled on to make Dhaka city work optimally as the capital of an independent country. The city has taken on an explosive character; just think of it, 150-200 new arrivals of automobiles ahead of your vehicle or behind it on a daily basis! It is incomprehensible how we are going to live with such fast shrinking space around us. Take chunks of the city away from their present locations through dispersal of decision-making processes, decentralisation of governance and growth epicentres strung out of the unworkable hub Dhaka has become. Unless split up and away, one fine morning we might find the whole city populace immobilised like a huge still photograph. The writer is Associate Editor, The Daily Star.